← Why Celebrate the Church Year? Epiphany is the day we celebrate the wise men finding Jesus, but it’s more than that. In Epiphany, our savior is revealed, first to the wise men, then through his baptism, his first miracle. Jesus did not remain hidden, rather Christ showed himself to us. Epiphany is an extension of our meditation on the incarnation that began in Advent. He dwelt in the world, not in secret, but with public words and deeds in a variety of places, that all may see him and worship, just as the wise men did when they found him. Many families have a tradition of building their creche (nativity scene) bit by bit through the season. The last part would be the wise men and the camels traveling from a far corner of the house. Even if you haven’t set this up before today, you could stick them in the corner right now and move them forward bit by bit until Epiphany dinner. 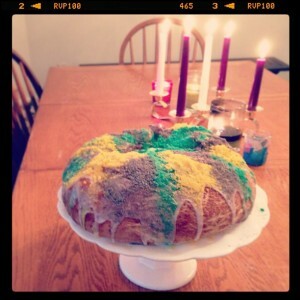 Baking a king cake and singing an appropriate hymn could also be a simple and easy step towards beginning to celebrate. “We Three Kings” is fairly familiar, and “As With Gladness Men of Old” is sung to the familiar tune of “For the Beauty of the Earth.” If you want to get ambitious and learn something new, there’s a great list here. For older children or adults, listening to T.S. Eliot read his famous poem, “Journey of the Magi” might be a good discussion starter. What would it have been like to be one of the magi? Light is a prominent symbol of Epiphany. You could make your dinner table extra bright (lots of candles or lights + candles) during the season. There are lots of great Bible passages about Christ as the light you could commit to memory, such as Matthew 5:14-16, John 1:4-5, John 8:12, Isaiah 60:1 & 19-20 or Ephesians 5:7-14. One fun idea for the season of Epiphany is to go geocaching. Seeking and finding something together is a great illustration for children, especially if you take the time to talk afterwards about what it would have been like to be one of the wise men. 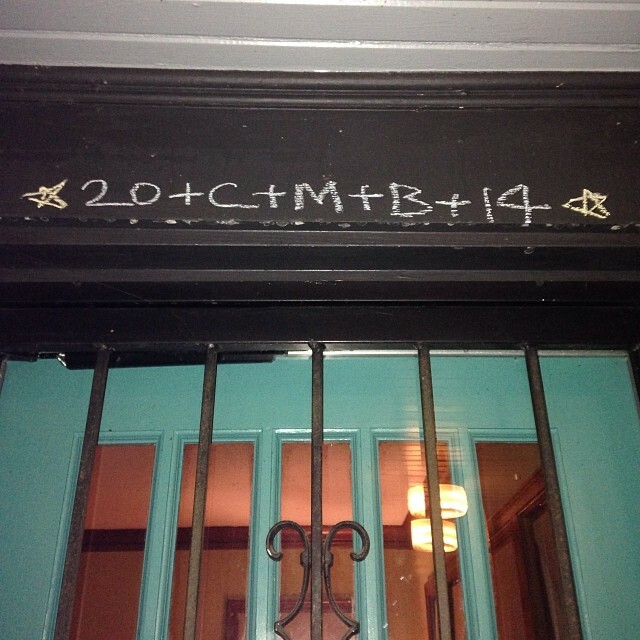 We participate in the European custom of chalking our door. The history of it is fuzzy, perhaps originating with a singing procession but I think thematically it fits well. You write the year with C+M+B in the middle of it, which either stands for the three wise men (Caspar, Melchior, and Balthazar) or the latin phrase Christus Mansionem Benedicat, which means “Christ, bless this home.” Here’s a small liturgy I’ve written for the occasion. Read Matthew 2:1-12. Sing an appropriate hymn. 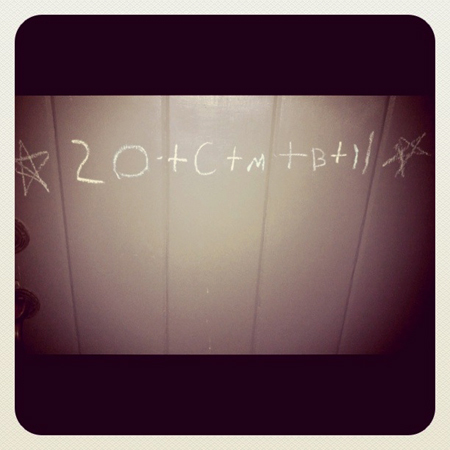 Migrate to the door you will be using (inside or out) and give each person a piece of chalk. “Many many years ago, wise men followed the light of a star to Bethlehem, and when they entered the home of Joseph, Mary and young Jesus, they knew that God was dwelling there, and they fell to their knees and worshiped. 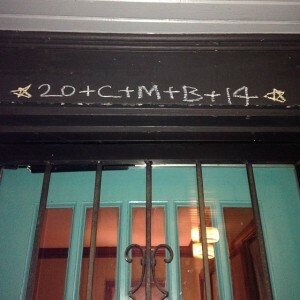 Take turns chalking 20 + C + M + B + 15. Oh, blest the house, whate’er befall, where Jesus Christ is all in all! For if He were not dwelling there, how dark and poor and void it were! To trust their God and serve Him still and do in all His holy will! And weary not of care or cost! May none to them and heaven be lost! And in their children’s lives is shown how richly God can bless His own. Though all the world forsake Thy Word, I and my house will serve the Lord! Thank you! I see this is from last year, but I was hoping you were (or had) written about it. We found “12 Days of Christmas” ornaments here — I love them. So we are counting the days to Epiphany. I want to make a King Cake (part of our New Orleans heritage!) and love the devotional ideas and lots of candles. Excellent—welcome back to your blog!